Southerner Abroad | No longer abroad, but still writing! I find that cleaning up after a skunk attack is not unlike cleaning up after a murder. You have to be meticulous; a single drop of skunk oil can cause immeasurable suffering. Ask me how I know. 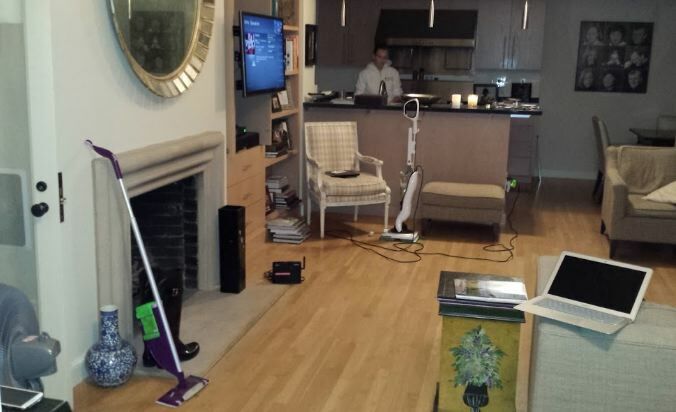 Notice the absence of rugs, the candles burning, the mop, the electric floor scrubber, and the fan. In hindsight, the candles and the fan were like bringing a cup of water to a forest fire. My dog apparently mistook a visiting skunk for her arch-nemesis, Rocky the Raccoon. Rocky steals her food, digs through the trash and stares at her through the window with that smug look that all raccoons have. So when the dog saw a small black animal in the back yard, she pounced. I never heard spray, but it didn’t take long for me to understand what happened. The dog ran directly into the living room and slid face-first onto the (expensive) rug. A second later, she was rubbing the other side of her face across a different rug. I noticed the long oily streaks on the rug at the same time that the overwhelming smell hit me. 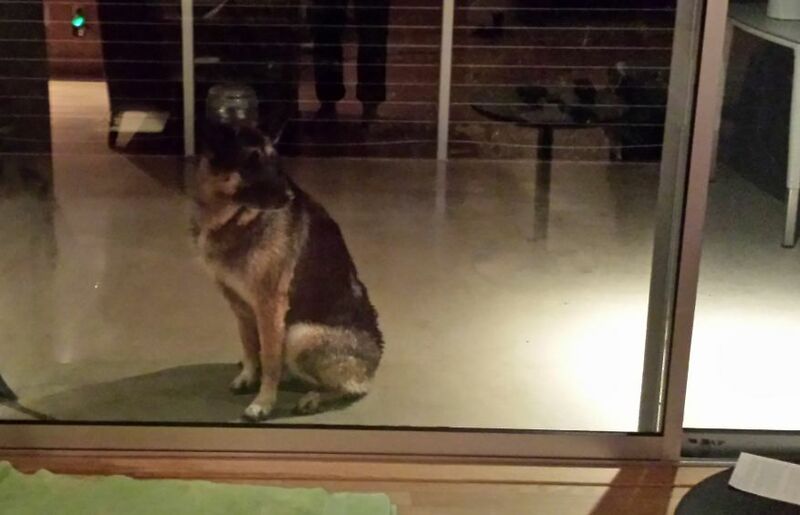 Step 1 – Lock the dog outside. This is her new home for the foreseeable future. 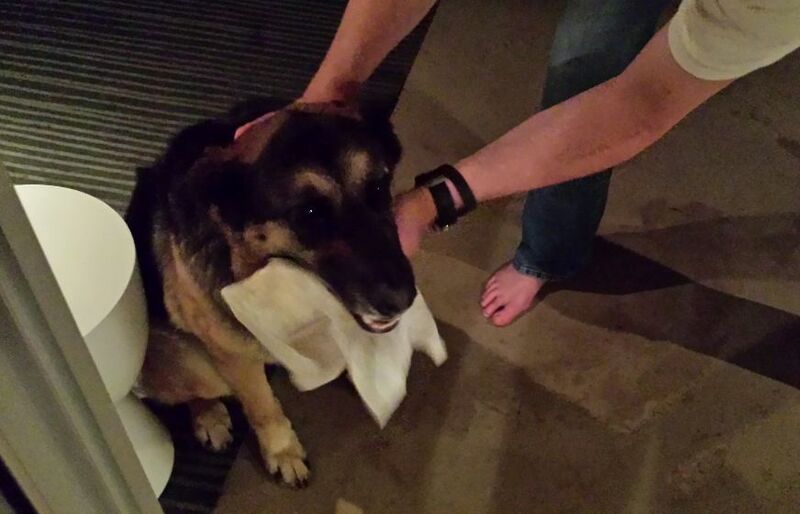 Step 2 – Use paper towels to soak up oil from the fur. She was happy to have someone rub the oil away from her eyes. Step 3 – Remove everything that she touched. EVERYTHING! 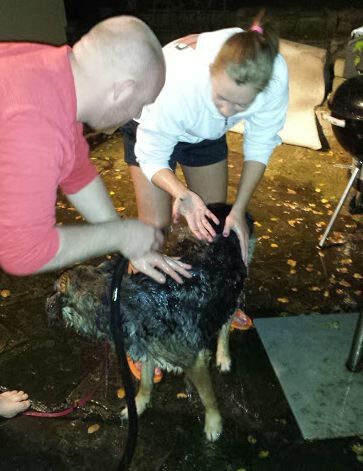 Step 4 – Wash the dog. By the third wash, she was over it. A day later and the smell is starting to fade. I still get whiffs of it a few times an hour. I’m beginning to locate the sources. My briefcase was too close to the action, so it still smells like skunk. My dad, who flew to china 8 hours after this episode, said that his watch band soaked up some of the oil. After some research, we learned that tomato soup does nothing to get rid of skunk smell. There is, however, a recipe that is said to do wonders. It’s a mix of baking soda, 3% hydrogen peroxide and dish soap. If it works, I’ll be sure to follow up here and let you know. Have you ever had a run in with a skunk? Were you able to get rid of the smell? Leave a comment and tell me about your experience. It’s been a week and I’m still here. The startup world hasn’t scared me away just yet. In fact, my job isn’t much different from any other job I’ve held. But there are a few things that will take some getting used to. My job changes every day. I’m a member of the sales team, but I am often loaned out to other teams when they need warm bodies. This is occasionally inconvenient, but it usually offers and interesting look into what the guys around me are doing. The company’s goals change constantly. I don’t mean short-term goals; the overarching vision for the future of the organization is subject to change. Few startups are able to enter a new market and maintain a steady course for very long. When the business plan meets the real world, constant course-corrections are inevitable. There is no such thing as a “normal workday”. This is similar to my time as a detective. Some days are 9-5, but that is subject to change suddenly. A coding mistake or a special request from a client can turn an 8-hour day into a 20-hour binge. I am responsible for becoming knowledgable about the market and product. Newborn organizations don’t have employee handbooks and training manuals. With such limited manpower, we have to train on the fly. After a week of studying, the jargon is becoming familiar and it no longer sounds my like coworkers are speaking a different language. There isn’t anyone to watch over my shoulder. As I government worker, I was accustomed to micromanagement. My current job is the opposite; I am trusted to do my work on time. Failing to do so risks disappointing my coworkers and causing them more work. This is a better incentive to perform than any overbearing manager can provide. I’ll continue to post as I have more to share with you. How does this compare to your work experience? If you’ve worked in a startup, or started a company, I want to hear from you. Leave a comment below. Despite the pessimistic outlook I expressed in a post a few weeks ago, some opportunities have come my way. I received two job offers last week, which left me with a difficult decision. Accept the safe, steady job with a traditional company, or join the Silicon Valley startup that offers potential for fast advancement, but at much higher risk? I had less than 48 hours to decide. The decision became easy once I weighed the starting pay against potential for upward mobility. I chose the startup. The traditional company was difficult to turn down because it was a safe bet and an opportunity to learn a new industry, but I couldn’t resist the excitement of joining a great company in its infancy. Today is my first day as an employee of Keen Systems, a company that is bringing small printing companies into the 21st Century. There are several products in Alpha and Beta stages, so I can’t share much, but our Web-2-Print platform represents an amazing opportunity for small companies in the print industry to take their business online and land new customers in one of the world’s fastest growing sectors. I’ll share more about my experiences working for a startup as I learn what I’m allowed to tell you. More to come. This view, from the kitchen of my parents’ home, is helping me deal with the sadness I’m feeling over no longer in Korea. That’s Angel Island out in the distance. The hills covered in houses is Sausalito. The view changes every morning thanks to the heavy fog and bright sun rising over the bay. 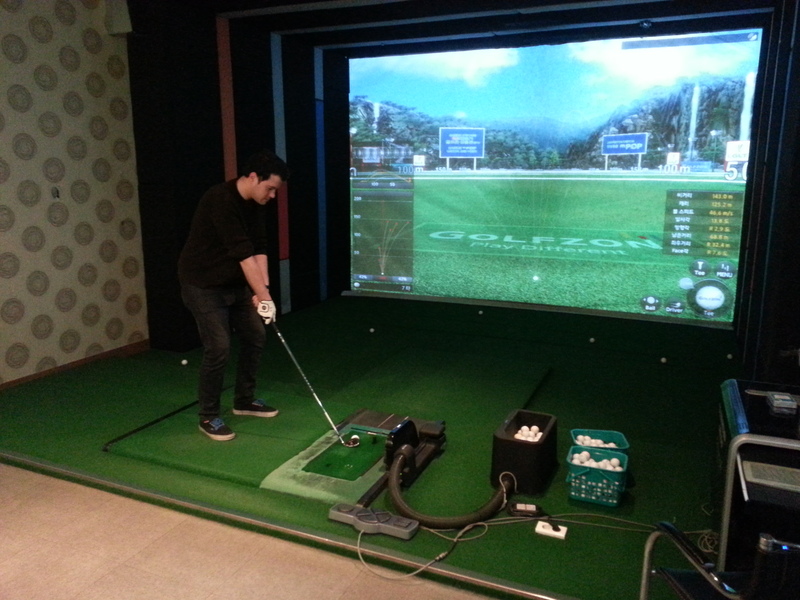 Two weeks before I left Korea, after a year of nagging, I broke down and agreed to accompany some coworkers to play screen golf. Screen golf is an indoor virtual golf game in which players use real golf clubs and balls to play an 18-hole game. This stunning marriage of real golf and video game was much more fun than I expected. It was so fun that I returned a few days later with my roommate for one last round. Each round of screen golf is $20 per person. This seems a bit high; my hometown public course is about the same price. Despite the price tag, it was a lot of fun and left me wanting more. The screen golf business was much larger than I expected. 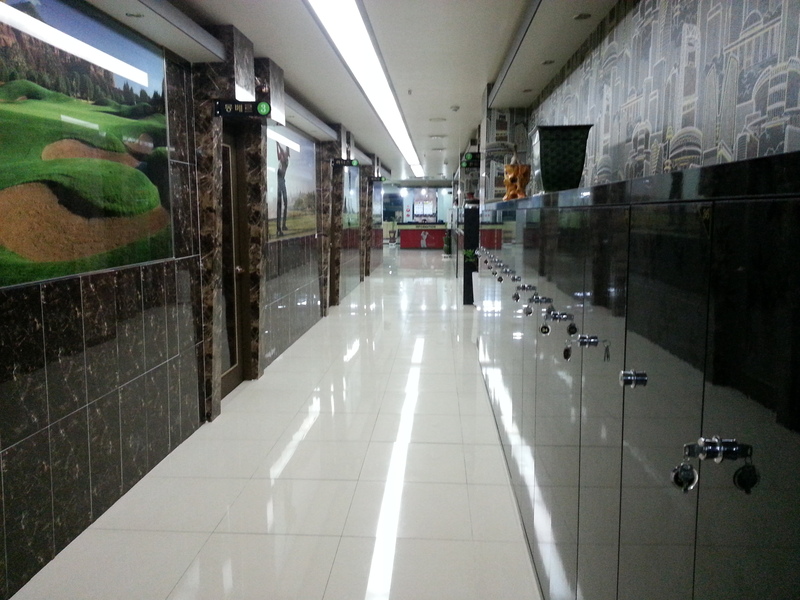 There were at least six private golf rooms, each with a couch, table, and golf screen. This computer controls the video portion of the game. The camera on top films you and gives you the option to replay it and watch your swing. 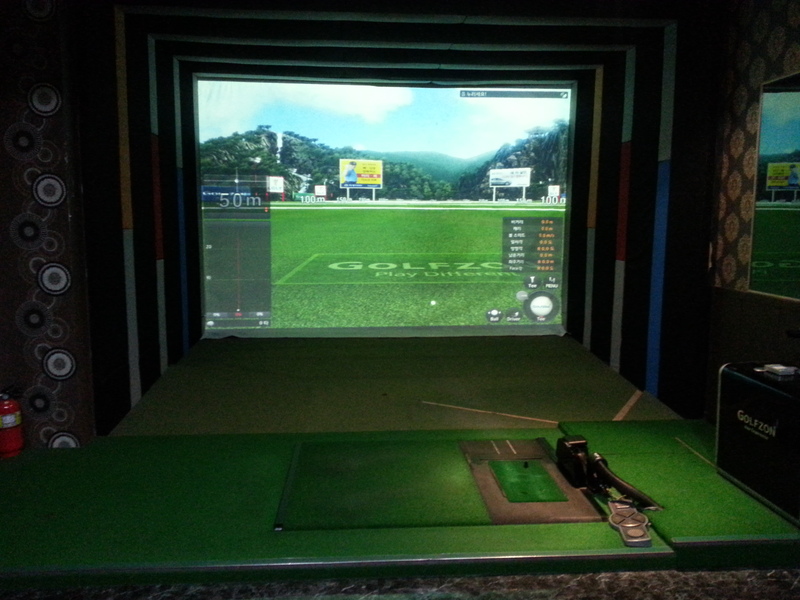 To play screen golf, you hit the ball full-speed into the video screen. The screen is nothing more than a thick white sheet that absorbs the energy of the ball. A projector displays the image of a golf course on the sheet, so it feels like you’re teeing up at a real course. 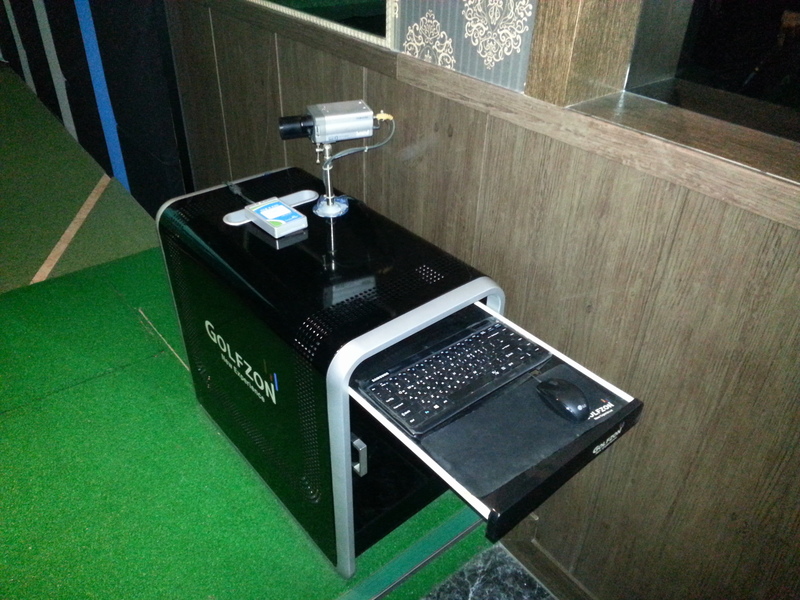 Several cameras and sensors judge the speed, spin and trajectory of the ball. The computer program calculates the shot so quickly that it really looks like you’re playing golf. Before the game begins, players can use the “driving range” and warm up. It’s surprisingly accurate. I know because I sliced every shot! My roommate, Adam, setting up for a practice swing. My only regret is not playing screen golf sooner. Every neighborhood has at least one screen golf business. My only hope is that there are some great places to play screen golf in the US.